The VX1000 System is a scalable solution with top performance for ECU your measurement and calibration tasks. It can be used in the vehicle – both in the cabin and in the engine compartment – on test benches and in the laboratory. Especially when developing ADAS ECUs, this allows you to control raw data captured by high-resolution radar sensors in combination with XCP data, e.g. object/tracking lists. The system forms the interface between the ECU and a measurement and calibration tool such as CANape. For high data throughput with minimal impact on ECU run-­time, data is accessed over the microcontroller-specific data trace and debug ports. The VX1000 Base Module is connected to the PC over XCP on Ethernet, an OEM-independent ASAM standard that is widely used in the automotive industry. The VX1000 measurement hardware is connected to the ECU via a POD (Plug-On device). Depending on the available microcontroller interface, either the data trace or a copying method can be used to acquire measurement data. Serial target interfaces are controller access points or debug interfaces at which the measurement data is acquired by means of DMA read/write accesses to the controller memory. A VX154x Serial POD is used to connect the VX1000 Base Module to targets with serial target interfaces. This POD is characterized by its very compact dimensions and extremely small power output. This group of target interfaces includes all the data trace interfaces with parallel data bus or with multi gigabit transceivers that – after initial configuration – automatically make the measurement data available as a data stream. A VX145x Generic HSSL POD is used to acquire the measurement data via this data trace interface. This POD is characterized by its compact dimensions and low power dissipation. 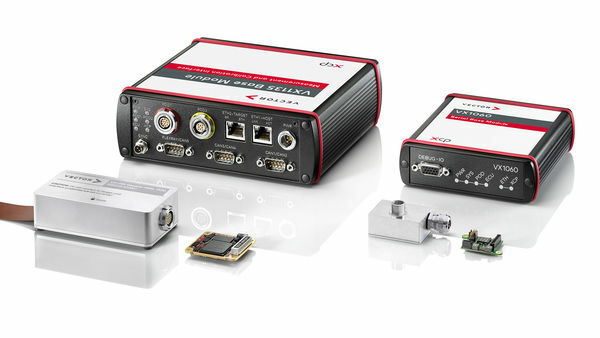 The VX1000 system is a scalable solution with maximum performance for your measurement and bypass task, for example, during radar ECU development. By means of microcontroller-specific data trace or debug interfaces, in this area measurement data rates of more than 100 MB/s are meanwhile achieved. For bypassing applications of ADAS Domain Control Units, the VX1000 System can be combined with the VN8912 bypass high performance platform. In this webinar recording you will receive a general overview of the Vector measurement and bypassing solution and details about customized applications in various ADAS areas. Do you have technical questions and are looking for suitable answers? Our KnowledgeBase provides the most important FAQs for you! VX1000 System is connected to debug and datatrace ports of an ECU. It enables very performant measuring, calibrating, bypassing and flashing via standardized XCP on Ethernet interface. The overview poster in format 594x420 mm (DIN A2) shows compatible system components for numerous supported microcontroller families.